Penned as 'The Definitely Maybes?' by News Of The World, 'The Maybes?' are set to release a new single and have announced details of a co-headline tour of the UK. Single 'Trick Of The Light' will be released through Xtra Mile Recordings on 30th March. The powerful track has been a favourite of fans at 'The Maybes?' live shows. 'Trick Of The Light' is the latest single from album 'Promises', released in autumn 2008. The Liverpudlians are known for their classic-sounding indie-pop, think early Britpop-meets-Beach Boys harmonies.. The tour starts on March 26th and works through a myriad of shows with co-headliners Club Smith as the bands raise their profile in 2009. Their catchy hooks and dancey, upbeat sound are sure to impress the masses as the Northern lads make headway this year. 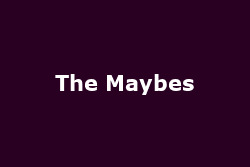 'The Maybes?' live performances are something not to be missed. Tickets are £6-£7 dependent on venue, and are on sale now.